MANILA, Philippines — Dwein Baltazar’s Oda Sa Wala, big winner in the recent QCinema international festival, is a curious yet lyrical study on the life and times of an embalmer in a funeral parlor and her friendship with a found corpse. Shot in brooding duotone by cinematographer Neil Daza, the film suggests that time not only passes slowly in the real macabre world, but patience and humor may be the only keys out of a humdrum, seemingly dead-end existence. Marietta Subong, a.k.a. the actress formerly known as Pokwang, essays the lead role of nothing from nothing, being front and center of this dark comedy that further conveys the unusual worldview of its director, also its writer and editor. Baltazar also made waves earlier this year at the CineFilipino festival in Manila, with Gusto Kita With All My Hypothalamus a well-wrought love poem for the Quiapo-Sta. Cruz area and the elusive chase for the muse in the urban maze. The film begins auspiciously enough with a shot of a light bulb surrounded by water moths (gamugamo) that usually signal the season’s first rain, with Chinese folk song Mo Li Hua playing in the background. When a pair of strangers pop up in the parlor with a bloodied corpse and ask the old maid Sonya (Subong) to clean it and keep mum, she has no choice but to comply and thereafter her luck seems to have changed, as if camaraderie with a dead old woman gives the embalmer new eyes to view the world. Suddenly, Sonya never runs out of stiff customers to service, and she gets back to talking with her equally cryptic father played by Joonee Gamboa. The corpse is dressed up and tidied, bathed and injected with regular supply of formalin to slow down decomposition, is even strapped to an upright wooden gurney to join the living during meals. Indeed, the bridge between father and daughter could be the corpse herself, a silence ironically becoming a wellspring for words. Sonya befriends a taho vendor, Elmer (Anthony Falcon), whose grandfather’s body she had also embalmed, and whose peddled sweet stuff makes the woman’s heart beat faster. Hijinks in the story come in the form of the usurer Theodor (Dido dela Paz), who never misses a beat to squeeze the funeral parlor owner of her meager earnings. Things eventually come to a head although in a quiet nondescript way. There’s hardly any music scoring except for the Chinese ditty, and the parade of customers seeking Sonya’s funereal service is a microcosm of grief’s varied faces, including the found corpse’s real daughter who is perhaps inexplicably turned away — we all have our motives, however dark and dreary. No spoilers here because it’s best to find time and catch the film yourselves wherever and whenever, a tonal poem easily one of the year’s standouts. The filmmaker has never been one to shirk topics that linger on the deep end. Her repetitious use of mirrors is reminiscent of Lino Brocka but inventive in and of itself. Oda Sa Wala, which is from a poem by Jim Libiran, may bring us a step or two closer to a distinctly Asian, if not Filipino cinema. It goes well beyond necrophilia, but a friendship unusual and touching that echoes the hollow in an empty soul. When one hits rock bottom, there is no other way but to consort with our respective found angels. 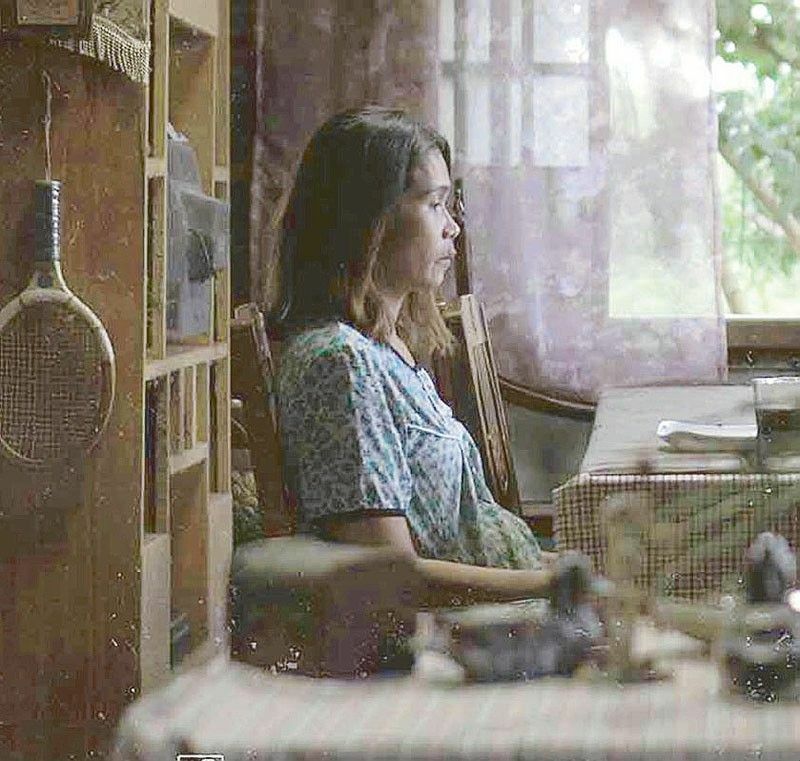 Like Raya Martin and Shireen Seno, filmmakers both named in consecutive batches of the 13 artists award, Baltazar should also be considered for a similar honor for her distinctly lyrical and memorable work. You’ll be hearing from her if you haven’t already, just like those plaintive Chinese songs spilling out of the shops on Ongpin Street.